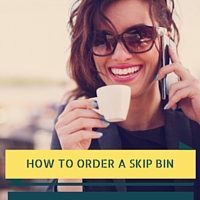 Seriously, ordering a skip bin is as easy as looking up a service, either online or on take out newspapers, calling them and telling them that you need a skip bin, simple as that. But, there are some things that you need to consider before actually hiring a skip bin. There are some questions that a company may ask you when you call them. To make your life easier, we’ve prepared a list of some of the most common questions asked when you order a skip bin. What kind of waste are you looking to dispose of? Not all waste materials can be placed into a skip bin and, in addition to that, different kinds of waste may have different weight limits and costs. Make a list of waste materials that you’re going to dispose of. What size of skip bin do you need? This can be a bit tricky, but a good way to assess what skip bin size you need is to make an estimate based on the volume of the area you’ll be working in. Most companies have a skip bin size page (like this one https://www.skipthetip.com/skip-bins/) so you can make a good estimate. If still in doubt, do not hesitate to ask the company for their advice. How long will you require the skip bin for? Typically, skip bin companies will let you hire a skip bin for 7 days. You can extend the duration, but additional charges may apply. If you think you’ll need the skip bin for more than 7 days, you’ll want to contact the company to arrange it for you. If you want your bin picked up earlier, that’s fine too. Where do you want us to put the skip bin upon delivery? Skip bins can’t be left on the street without a permit, therefore, it should be placed on your property. The company will try their best to put the bin in the best place for the fastest and easiest access, but this will depend on the dimensions of your property.